Two Shakespeare plays in the same season? Well.....kind of. Yesterday, I posted a blog about the upcoming production of King Lear starring Glenda Jackson. Well just one week later, another Shakespearean themed play will begin previews as well. Gary: A Sequel To Titus Andronicus, is set to begin previews at the Booth Theatre on March 5, 2019, with opening night scheduled for April 11. Now except for a production of Julius Caesar starring Denzel Washington that I saw over fifteen years ago, I have never seen a play by "The Bard". Now as you can guess by the title, this new play takes place immediately following the tragic events in Titus Andronicus. However I have a feeling that this production will not be as tragic. Why? Well probably because the show is starring two of Broadway's greatest comedic actor's of all time. I am of course talking about Tony Award winners Nathan Lane and Andrea Martin. Oh and plus the show is listed as a new comedy by Taylor Mac. So now that you know it's a comedy, I guess you probably want to know how to get tickets right? Well do I have good news for you. We sell it. In fact if you call right now, you can get tickets to see the show at prices that can't be beat. Be advised that while this "Special Offer" is good thru April 13, is for select seats only, and as always subject to availability. Get your tickets to see Gary: A Sequel To Titus Andronicus on Broadway at the Booth Theatre. Until next time theatre fans. Big news theatre fans. One of Broadway's most celebrated plays is headed back to the stage. Burn This, which first premiered on Broadway in 1987, is set to begin previews at the Hudson Theatre on March 15, 2019, with opening night scheduled for April16. Directing the play is Tony winner Michael Mayer (Spring Awakening, Hedwig and the Angry Inch). Starring in the Lanford Wilson drama is Adam Driver (The Last Jedi) and Kerri Russell (The Americans). Now if that doesn't make you want to see it then I don't know what will. So what is the show about? Well I'll tell you. Burn This tells the story of Anna, a dancer and choreographer who must deal with the sudden death of her roommate and dance partner Robbie. Upon his passing, Anna is visited by Robbie's brother Pale, who comes to pick up his belongings and ends up staying on in her apartment, turning her life upside down. Tickets for the show are now on sale.Oh and did I mention that we are selling it? Well we are. Well that and every other new show this season. Get your tickets to see Burn This on Broadway at the Hudson Theatre. Until next time theatre fans. King Lear on Broadway starring Academy and Tony Award winner Glenda Jackson? Count me in theatre fans. Now I'll be honest, until I saw the most recent Broadway production of Three Tall Women, starring the above mentioned Ms. Jackson, I had never seen her in anything except her film work. After all, her last Broadway appearance was her Tony Award nominated performance as Lady Macbeth in Macbeth. Now here we are over thirty years later, and the acclaimed actress is headed back to the Great White Way in one of the greatest roles of all time. Previews for the show are scheduled to begin at the Cort Theatre on February 28, 2019, with opening night set for April 4. Tickets for the William Shakespeare drama are now on sale. Not only that, but we are selling it. Plus if you call right now, you can get tickets to see the show at prices that can't be beat. Be advised that while this "Special Offer" is good thru April 7, it is for select seats only, and as always subject to availability. Get your tickets to see Glenda Jackson in Macbeth at the Cort Theatre on Broadway. Expect the show to be a big contender at next year's Tony Awards. Until next time theatre fans. In the Spring of 2000, I saw one of the most amazing things that I have ever seen. It was the Broadway revival of Sam Shepard's True West, starring John C. Riley, and the late Phillip Seymour Hoffman. Two amazing actor's at the top of their game. It doesn't get any better than that theatre fans. Now here we are almost nineteen years later, and this fascinating drama is headed to the stage once again. Starring Academy and Tony Award nominee Ethan Hawke (Boyhood, The Coast of Utopia), and Golden Globe nominee Paul Dano (12 Years A Slave, Love and Mercy), and directed by Obie Award winner James McDonald (Love and Information, Cloud 9), True West, is scheduled to open at the American Airlines Theatre on January 24. By the way, for those of you who want tickets to see the show, you are in luck. We sell it. In fact if you call right now, you can get tickets to see the show at some amazing rates. Be advised that while this "Special Offer" is good thru February 3, it is for select seats only, as as always, subject to availability. Get your tickets to see True West on Broadway at the American Airlines Theatre. Until next time theatre fans. Has it really been seventy-five years since this beloved Broadway musical first captured the heart's of theatergoers around the world? Time sure does fly in the theatre world now doesn't it? Oklahoma!, which first premiered at New Haven's Shubert Theatre in March 1943, is set to begin previews at the Circle in the Square Theatre on March 19, 2019, with opening night to be announced. Now believe it or not, but Oklahoma! was the first musical I ever saw. Not on Broadway mind you. I mean I'm not that old. This particular production was in my hometown of Paris, Illinois in 1979. To say it had a profound effect on me is an understatement. It's probably one of the reasons why less than thirteen years later, I moved to New York. But enough about me. You came here to get more info on this Broadway classic. The show, which just finished a sold out engagement at St. Ann's Warehouse in Brooklyn, is being directed by Daniel Fish, with choreography by John Heginbotham. Casting as well as an on sale date have yet to be announced. Be sure to check this website for further updates. Expect the show to big a big contender at the 2019 Tony Awards. Until next time theatre fans. I never thought this day would come. Yes I know show's close all the time. I guess I just thought that Avenue Q would last forever. It was recently announced that the show, which won the 2004 Tony Award for Best Musical of the Year, will play it's final performance on April 28,2019. When it closes, it will have played a total of 6,537 performances, which includes both the Broadway and Off-Broadway run. Now it goes without saying, that I am a big fan of the show. After all, I've seen it over a half a dozen times. In fact, it was the very first Broadway show my parent's ever saw. Not only that, but they still talk about it today, over fifteen years later. I guess they loved it too. Now for those of you who still haven't seen the show, there is still plenty of time. Over five months to be exact. In fact if you call right now, you can get tickets to see this hilarious musical at prices that can't be beat. Be advised that while this "Special Offer" is good thru April 28, it is for select seats only, and as always subject to availability. Get your tickets to see Avenue Q Off-Broadway at New World Stages. You will love it. Until next time theatre fans. That's right theatre fans. It's that time again. Time to celebrate another show opening on the Great White Way. So who's turn is it this time? Well if you read the title of my blog, you know that it is the brand new stage adaptation of Harper Lee's To Kill A Mockingbird. Now I am ashamed to say, that I have never read the book. I haven't even seen the Academy Award winning film. That doesn't mean I don't want to see it. After all, it does star Emmy winner and Tony Award nominee Jeff Daniels (Newsroom, Blackbird) as lawyer Atticus Finch. Plus, it it being adapted by Academy and Emmy Award winner Aaron Sorkin, (The West Wing, The Social Network), and directed by Tony Award winner Bartlett Sher (South Pacific, The King and I). I mean those three reasons alone are enough to make you want to see it right? I though so. But of course it all comes down to the $64,000 question. "What did the critic's think"? Let's find out. Today's customer story comes all the way from the "Lone Star" state. That's right. I am talking about Texas. Fort Worth to be exact. A couple of days ago, I received a call from a regular customer of ours who was coming in to New York next week, and wanted to see a show called The New One. Now when she first called, I admit that I had never heard of it. Trust me. I was surprised too. Anyway after a little research, I realized I had heard of it, as it was written by, and starring Mike Birbiglia, who had a huge hit ten years ago with Sleepwalk With Me. Now it all made sense. Anyway, after finding out what they wanted to see, I asked her what date she wanted to see the show, and of course where she wanted to sit. Thankfully the Cort Theatre is one of the smallest theaters on Broadway. Therefore all the seats are good. Plus because they selected a play, and not a musical, I knew that it would not be as expensive. I was right. In the end, I got them excellent seats in the Center Mezzanine. And of course, at a price that was lower than she was expecting. Another satisfied customer. Will you be next? What's that? Two Broadway show's opening in the same week? What is this April? Anyway, last night the Broadway production of Network starring Tony and Emmy Award Bryan Cranston opened at the Belasco Theatre. Directed by Tony Award winner Ivo Van Hove (A View From The Bridge), and adapted by Tony Award winner and Academy Award nominee Lee Hall (Billy Elliot), Network also stars Emmy Award winner Tatiana Maslany (Orphan Black), and Tony Goldwyn (Scandal). So what did the critic's have to say? Let's find out. That's right theatre fans. The 2018-2019 is about to get one "Hell" of a show. Like how I did that? Hadestown, which first premiered Off-Broadway in 2016 at the New York Theatre Workshop, will begin previews at the Walter Kerr Theatre on March 22, 2019, with opening night scheduled for April 17. The show, which is currently running at the National Theatre in London thru January 29, is being directed by Tony Award nominee Rachel Chevkin (Natasha, Pierre and the Great Comet of 1812), and features book, music and lyrics by singer-songwriter Anaïs Mitchell. Now I'll admit, I've never heard any of her music. However, as someone who has written their own musical, I decided to give her music a little listen. The verdict? I liked it. It reminds me of Once, with a little hint of Frank Wildhorn's Bonnie and Clyde, mixed in with a side of Waitress. Quite the compliment I think. So what exactly is the show all about? 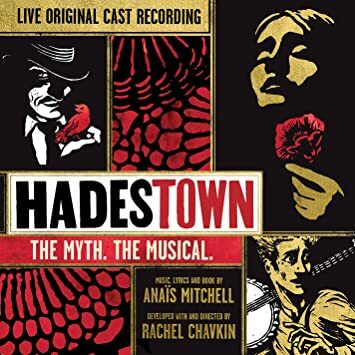 Well according to the show's website,"Hadestown, set in a Great Depression inspired apocalyptic setting, is a new musical about the fateful love story of Orpheus and Eurydice, as well as the tumultuous relationship of King Hades and his wife Persephone." Sounds like a laugh out loud evening in the theatre to me. Just another joke there theatre fans. No on sale date has been announced as of yet. Be sure to check this website for further updates. Until next time theatre fans.